Said Broncos coach John Fox: "He's just a competitive dude. He's super competitive. He never lays his sword down. He's going to fight you to the death." 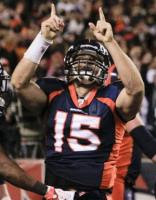 -On Tebow's 20 yard touchdown run, in the last 50 seconds of the game, to beat New York! Here's an interesting analysis of TT from sportswriter Martin Manley of the Kansas City Star.